Hey all! I'm going to be taking a break from the blog from the rest of the summer. I'll be back posting new books in September. Feel free to submit your quiet books to the blog email during the next month and a half, but I most likely will not respond until I'm back in September. 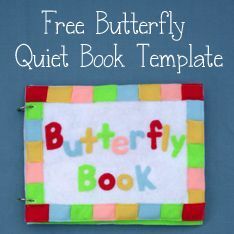 Today's quiet book comes to us from Wendy, a grandmother living in Spain and author of the blog Spanish Crafter. It's very cute and has some great ideas. Some of the things I love about it are the buttons on her weaving page (such a great way to keep the fabric strips from flopping everywhere! ), the bead page with tons of beads on strings, the alphabet bead page with square beads that can be rotated around to spell new words, the adorable flower page, and the alphabet page with letter flaps. There's lots of great ideas in here! Enjoy! My name is Wendy L (Spanish Crafter) and I am 57 years old, retired and living in Spain. I have 3 grandchildren, so this is for the eldest granddaughter Hollie who is 3 years old. 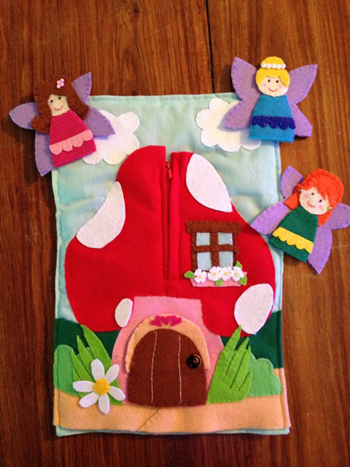 I used to sew when my sons were little and I had to buy a new sewing machine to make this book as mine was over 34 years old. This took me about 2 to 3 weeks, maybe 40 or 50 hours in total. I looked on Pinterest and YouTube for inspiration. I used a Crop o Dial to punch holes and grommets with 2 1a d 1/2 inch rings to bind it. 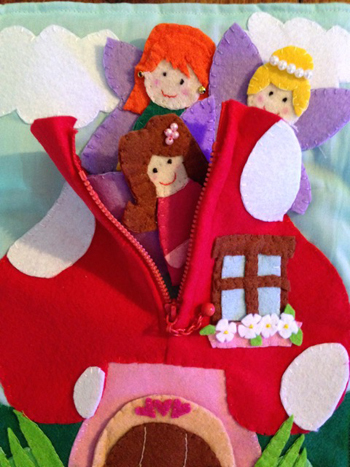 It is made from felt as that means no fraying. Hard to say how much it cost as I am a card maker so many of the things I used I already had in stock. Hard to choose a fave page as I like them all and hope Hollie will too. I like the counting page with the buttons underneath each flap. Wendy, thank you so much for sharing your great quiet book with us! Today's quiet book comes to us from Yankee, and it is so cute. The front cover has a name sewn onto it, along with a car that has a little pocket. 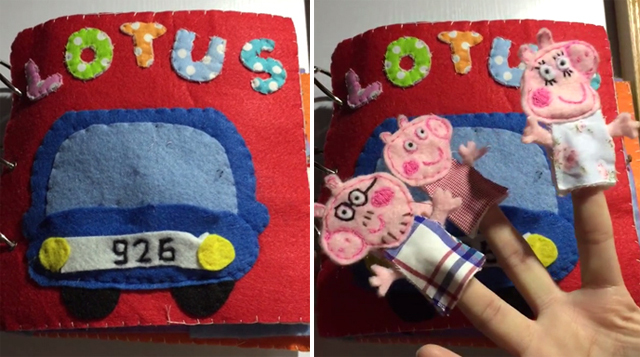 Peppa Pig and her family are finger puppets that fit into the pocket and look like they're driving in the car. The book opens up to show a car page with several adorable little vehicles, including an ambulance and a fire truck, and several road signs (like a traffic light, stop sign, etc.). Across from the car page is a laundry page with a washing machine, lots of clothes, a clothes line, and socks that velcro off the page. Next Yankee has a clock page with colorful numbers and moveable hands, and a shoe-tying page where children can practice making a bow. Next comes one of my favorite pages - Cookie Monster! Cookie Monster's mouth zippers open and you can pull out a lot of cookies, each of which has a different number of chocolate chips sewn on top. These match to numbers on the next page, for children to practice counting and number recognition. The next page is absolutely adorable, too. It's a nature scene with an apple tree (whose apples you can pick and put in a basket) and several animals to play with - a cow, giraffe, elephant, and lion. 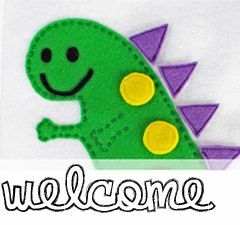 Opposite the apple tree page is an alligator (or crocodile) with a bird on his nose and a zipper mouth. Underneath him in the water there are several fish that can velcro off the page and go inside of his mouth. The last pages in the book are a flower page and a shape page. The flowers can button on and off of their stems and store in the flower pot. The shapes page has ridiculously cute shapes (I love how they're puffy/stuffed) which velcro off and can be matched the their embroidered shapes on the page. It is an adorable book and looks so fun to play with. Thank you for sharing it with us, Yankee! 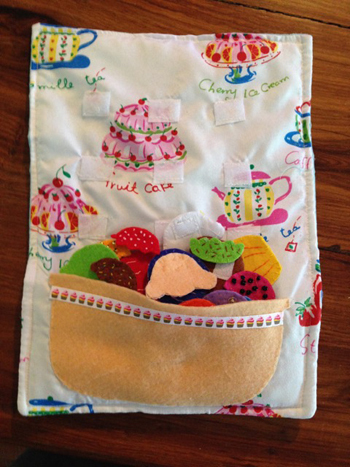 Today's adorable quiet book comes to us from Mandrina, a Canadian living in England. 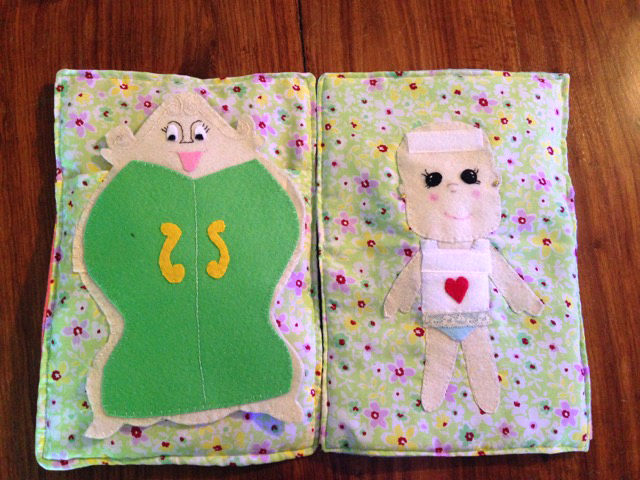 She made this book for her daughter, a toddler, and it is awesome. It is absolutely jam-packed full of fun activities. She starts out with a Matryoshka doll page (Russian stacking dolls). They're something that I've never seen in a quiet book before and it is a really cute way to teach kids about big, bigger, and biggest. 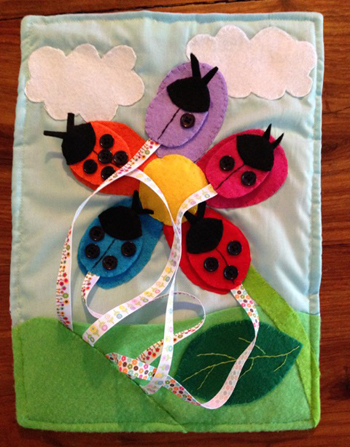 Mandrina then has a flower page and a forest page (with little animals hidden that can play peekaboo). Next Mandrina has two space pages: one of the solar system with all the planets, and one with an astronaut, rocket, and alien. She made her daughter the astronaut. :) These pages are followed by a build-a-robot spread, and two snow pages where you can decorate a snowman. Following the snowman there's a laundry page, complete with washing machine and socks that you can match up on the page. The clothing theme continues into the next spread, which is a girl's bedroom with a wardrobe full of clothes. On the opposite page there's a doll that you can dress up with all the clothes from the wardrobe. The next pages take us outside to a farm, where a barn is filled with adorable finger puppets (and I love the fabric used for the background!) and a tractor goes up the hill where you can pick carrots and radishes. We then go underwater to one of the cleverest shape pages I've ever seen. All of the ocean animals are particular shapes, so you can practice with your toddler by asking them where the triangle-shaped fish is, the rectangle fish, and so on. 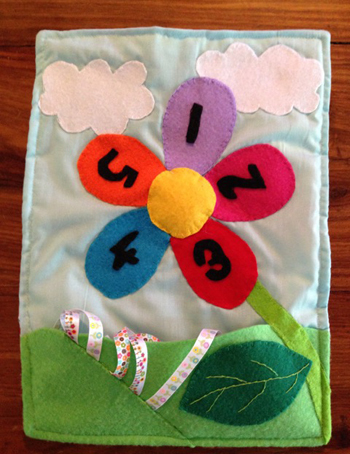 The next page is an alphabet page with the ABCs sewed on to the page and also stored in little pockets, followed by a quilt page, and then the cover, which is made of cute fabric and has handles for easy carrying. My name is Mandrina and I'm a mom. If my former self were to meet me now she would probably lol. 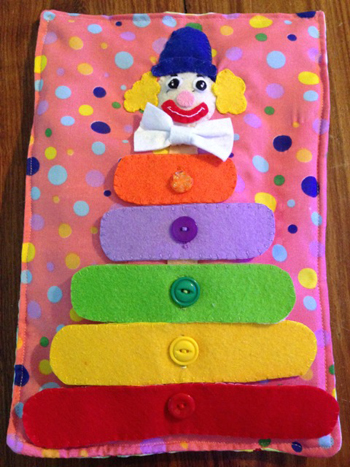 I made this book for my daughter who's 20 months old. I've been sewing off and on (mostly off) since I was a kid. 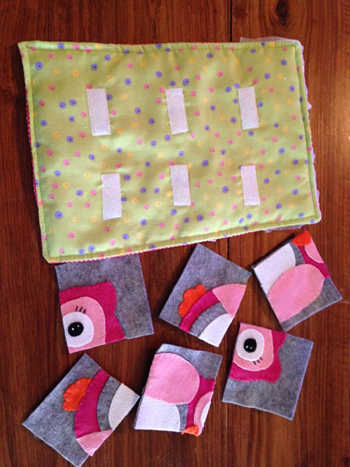 Becoming a mom has re sparked my interest in sewing and I've becoming a bit of a Pinterest junky. I still feel like a beginner. My work isn't perfect but I'm happy with the finished project. I worked on it over three weeks for a few hours a day while my daughter was napping. I've fallen behind on a lot of other things. I spent hours on Pinterest looking for inspiration for the pages and used templates from imagineourlife.com for the solar system, astronaut, socks and robot pages. 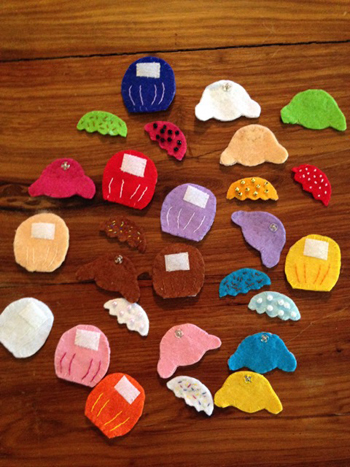 Her designs are adorable and she has a great Montessori inspired blog. On the snowman page, I directly copied the skiing snowman from betzwhite.com. I bound it with 3.5" rings pulled through button holes on each page and made a canvas cover with handles. I've been collecting loads of different fabric remnants, fat quarters and scraps. 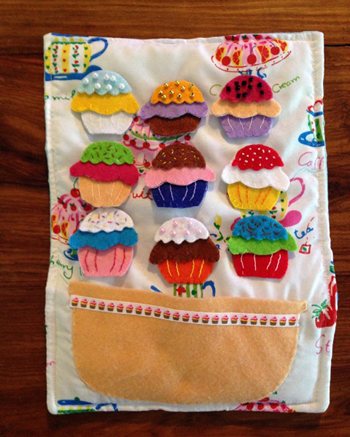 I used felt and various cotton bits. I used sequins, buttons, snaps, velcro, beads, clear vinyl sheets and ribbon as well. I think it all probably cost about £40 once I finished. My favourite page is the forest page with my daughter's hand as the tree branches and the hiding animals because it's one that I designed on my own. I think it's also the one that took the least amount of time to put together. Mandrina, thank you so much for sharing your fantastic book with us! Today I get to share with you a dinosaur-themed quiet book that is totally awesome and unique! 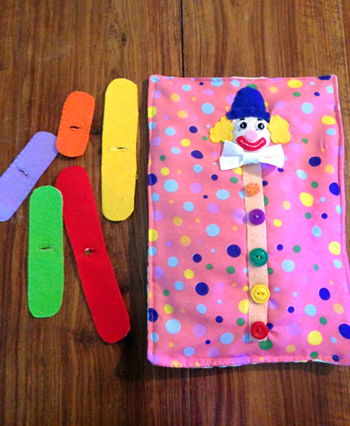 Sarah made this "roll up" quiet book for her friend's son. I've never seen a quiet book made quite like this before. Instead of sewing the pages back to back and then binding them all along one edge, Sarah sewed all the pages side by side to one piece of background fabric. Think: quilt. It's a great idea if binding a quiet book seems like an intimidating prospect; sewing the pages together like this would be very straightforward. And the ribbon on the outside that ties it together when it's rolled up is so cute! 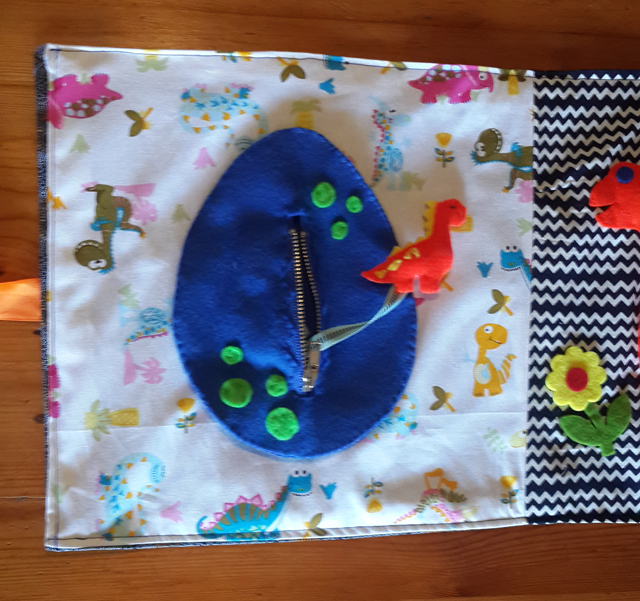 Each "page" of this quiet book has a different dinosaur or activity, with cute fabrics chosen for the background (I personally *love* that the little dinosaur that comes out of the egg matches the big dinosaur on the next page). Please, enjoy! Sarah. 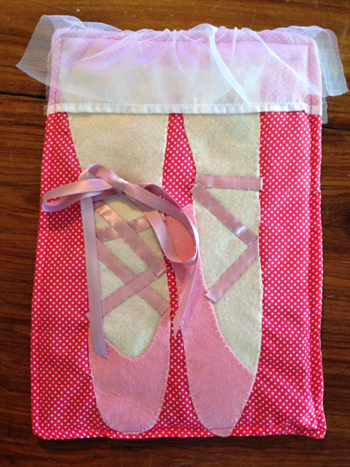 Finance Director, amateur arts and crafts, complete beginner in sewing. 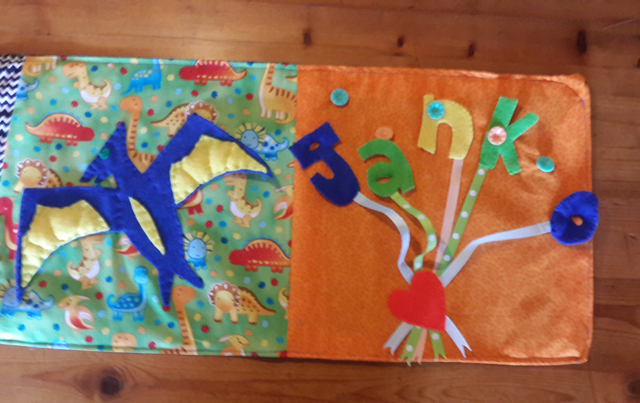 A friend's son, Janko, who is turning 1 years old and having a dinosaur theme party. Beginner. I purchased a basic sewing machine a month ago and this was my third time using it (reading instructions and youtube). Probably 15 hours spread over a week. 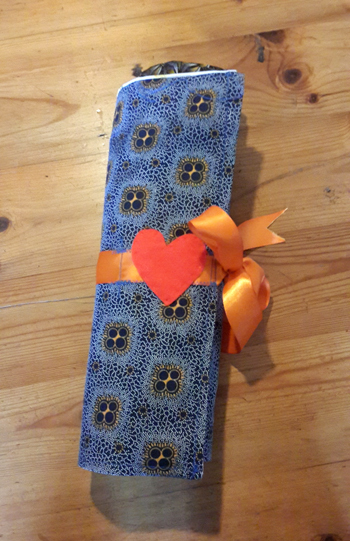 As a beginner, I didn't bind it (too complicated for me) but sewed it all together to roll up and tie with a ribbon. Sewing the ribbon on was so easy and I think it looks really neat. Material (I don't even know the difference between material types!) with felt. The material on the back is a local south african material called tshwe-tshwe which is quite thick and stiff, which gives a bit more structure and won't show dirt. Well I have alot of felt to use for more projects, the parts for this project probably cost not more than R200 (USD 20). The square with Janko's name which he can button off. Sarah, thank you so much for sharing your awesome quiet book with us! Happy Monday, everybody! Happy Independence Day to all the Americans out there; I hope you had a good holiday weekend. 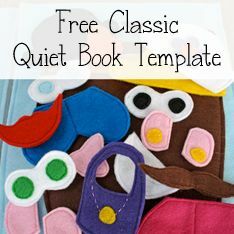 Today's quiet book comes to us from Michelle of the blog Sew Little Time. It is absolutely adorable and has so many cute pages. 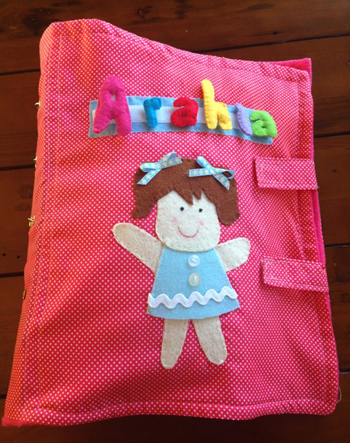 She made it for her daughter Arahia, and the cover has her name spelled out in letters that she can velcro on and off. It also has a little felt doll of Arahia, which is just as cute as can be. 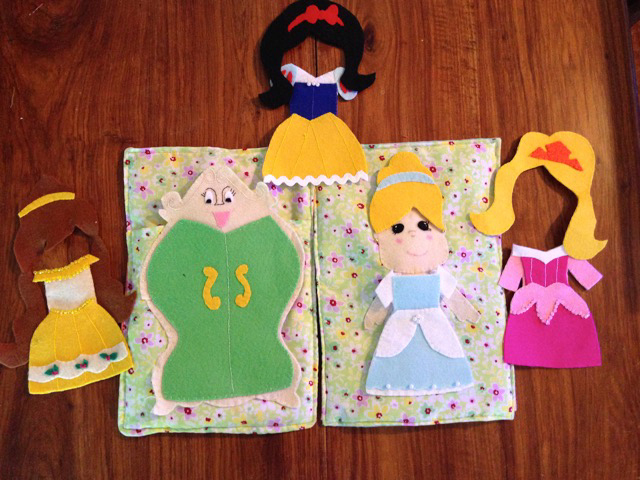 The pages inside the book include a Disney princess dress up page, with outfits for Belle, Snow White, Cinderella, and Sleeping Beauty, and the wardrobe from Beauty and the Beast. 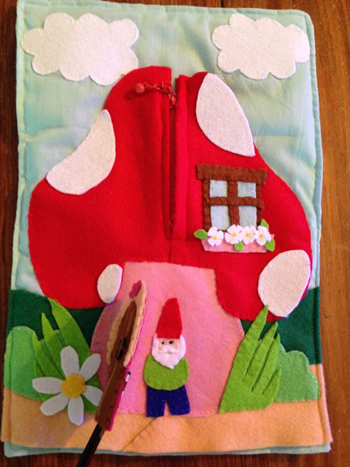 Another page has an adorable toadstool (mushroom) house that zippers open to reveal three fairy finger puppets, and a door that opens to show a little gnome. 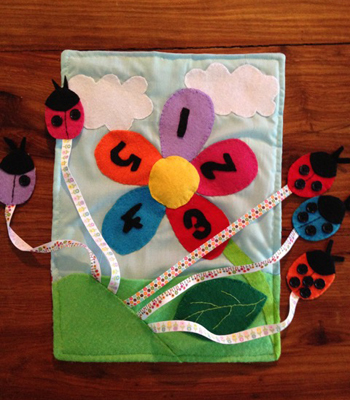 The next page has a flower whose petals have numbers on them, and ladybugs on ribbons with numbers of dots on their backs that correspond to the petals. There's also an awesome cupcake decorating page, clown stacking rings page, owl puzzle page, ballerina shoe lace-up page, Rapunzel hair-braiding page, and a dog page with a collar that buckles. Enjoy! 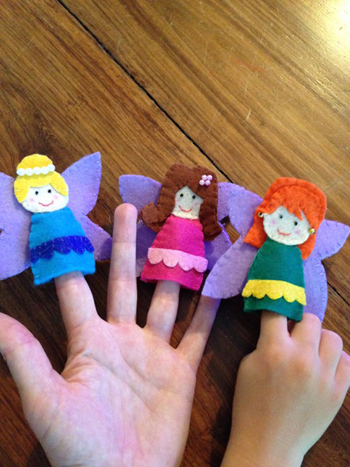 My name is Michelle, I have two beautiful children and I love to craft in my spare time. This book was made for my daughter, Arahia. She is only 8 months old but my four year old son is currently enjoying it. Although, he does tell me it’s a bit too girly for him. I am probably an advanced beginner. This took me a couple of months of mainly sewing during nap times. I bound this book together using eyelets and binder rings. Lots of bits and pieces from my stash. I love the dress up doll page. I loved all the Disney movies as a child. 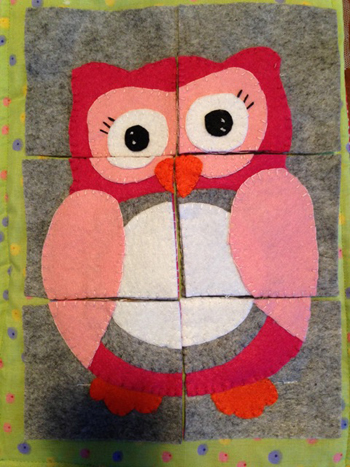 To see more pictures of Michelle's quiet book, check it out on her blog: Sew Little Time - Quiet Book Page 1. 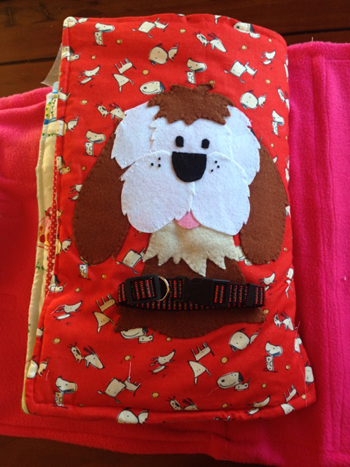 Michelle, thank you so much for sharing your super adorable quiet book with us!